Just a few blocks west of St. Mary Major Basilica stands the lofty Victorian-gothic church of San Alfonso. Atop a long staircase beside the church is the International Headquarters of the Congregation of the Most Holy Redeemer, the Redemptorists. The sacred picture of “Our Mother of Perpetual Help” is fittingly venerated in this church named after the Marian Doctor of the church St. Alphonsus Liguori. It was he who wrote that great spiritual classic, The Glories of Mary. It is his sons, the Redemptorists, who are the custodians of the shrine and picture. 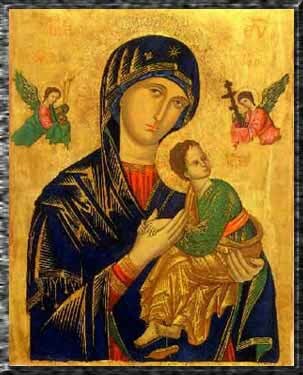 They are forever associated with this miraculous image through their apostolic zeal in fostering reverence and devotion to our Lady of Perpetual Help throughout the world. The story of this Icon is one of the most unusual and involved stories of the many Marian shrines and miraculous images throughout the world. The painting originally came from the island of Crete where it had been venerated for a number of years. The earliest written account is from an old document-plaque written in Latin and Italian which was placed before the Icon in the church of St. Matthew where it was first venerated in Rome in March of 1499. Some two years before that a merchant in Crete, who was returning to Rome took the picture just before sailing and hid it among his belongings. Some think he might have taken it to save it from possible profanation or destruction from marauding Turks, but the document says that he simply stole it. While at sea, a life-threatening storm arose and everyone on board thought their end was near. The sailors, not knowing of the presence of the concealed icon on board, prayed loudly to Our Lady for help. Against all odds, the vessel safely reached Italy. It would appear, as subsequent events will show, that Our Lady definitely wanted this picture to be venerated in Rome. Our Lady appeared again to the man and said that he would be punished for not carrying out her wishes. Soon thereafter he sickened and died. Our Lady then appeared to the merchant’s daughter asking that the icon be exposed for popular veneration in a church. She told the girl: “Tell your mother and your grandfather that St. Mary of Perpetual Help wants this.” The mother, now quite frightened, confided the story to her neighbor who scoffed at the whole account. She offered to take the icon for a while, but she too became deathly ill.
She needed nothing more to accede to the Madonna’s wishes, and promised to see them fulfilled. Thereupon she was restored to health. Our Lady of Perpetual Help was still not finished. She appeared again to the small daughter indicating the exact location where she wanted the image venerated—midway between the basilicas of St. Mary Major and St. John Lateran. The church which then stood halfway between these basilicas was St. Matthew’s. The wife of the merchant went at once to the Augustinian friars who served that church and told her story. The friars came to see the picture and were so impressed with its beauty that they made plans at once for a solemn transferal to and exposition in their church. And so it happened on March 27, 1499. St. Matthew’s soon became a popular pilgrimage place in Rome and the icon was venerated there for three hundred years. In 1798, French troops occupied Rome. General Massena, the governor, decided that Rome had too many churches. Undoubtedly, he had his eyes on the valuable property which they occupied. He ordered thirty churches to be closed and destroyed. St. Matthew’s among them. For sixty-eight years nothing more was heard of St. Mary of Perpetual Help. People who did give it a passing thought presumed it had been destroyed along with St. Matthew’s church. The series of events that resulted in the restoration of the icon to public veneration is so completely beyond chance that it had to be Our Lady who wrote the scenario making it happen. When the Augustinian Fathers were ordered to leave St. Matthew’s church they moved to a nearby church, St. Eusebius, taking the sacred painting of Our Lady with them. Several years later they relocated again to the church of Santa Maria Posterula. Here the icon was eventually moved and placed over a side altar in a small oratory because the main altar already enshrined a Madonna called Our Lady of Grace. During the pontificate of Pope Pius IX, the Redemptorists were invited to set up a mother house in Rome. They chose a vacant lot on the Via Merulana, without realizing that it once had been the site of St. Matthew’s church and the shrine of the famous icon. They built next to their general headquarters the small church of St. Alphonsus. One day at recreation, one of the fathers mentioned that he had read an account on old shrines of Our Lady in Rome and recounted how the icon of Perpetual Help had been enshrined in St. Matthew’s church that stood close to the place now occupied by St. Alphonsus’ church. The fact that the original icon was not lost and that St. Alphonsus church was midway between St. Mary Major and St. John Lateran must have caused bedlam at that community recreation as the Redemptorists put the pieces of the mystery together. Their own church of St. Alphonsus occupied the very ground on which the old St. Matthew’s Church was located, and now the lost sacred icon had been found. They came to the conclusion that even as Our Lady had chosen this location for the Perpetual Help image to be enshrined many years before, the Blessed Mother must have been instrumental in setting the stage for the icon to be returned to its original site. The Father General of the Redemptorists, Most Rev. Nicholas Mauron, decided to bring the whole matter to the attention of Pope Pius IX. The Pope listened attentively and felt sure it was God’s will that the icon should be gain exposed to public veneration and the logical site was their church of St. Alphonsus, standing as it did between the Basilicas of St. Mary Major and St. John Lateran. The Holy Father at once took a piece of paper and wrote a short memorandum ordering the Augustinian Fathers of St. Mary in Posterula to surrender the picture to the Redemptorists, on condition that the Redemptorists supply the Augustinians with another picture of Our Lady or a good copy of the icon of Perpetual Help. Our Lady chose the first, and the boy was cured at once. The next day he toddled along with his mother to St. Alphonsus’ church and stood before the picture. He waved his little hands to the Madonna and cried “Grazie, grazie” and threw her some kisses in the loving Italian style. As the procession was passing another house, another mother called upon Our Lady of Perpetual Help to aid her eight-year-old daughter who was completely paralyzed. At once the girl regained partial use of her limbs and was able to move about a bit. The next day the mother brought the child to St. Alphonsus’ church to thank Our Lady and ask if she would not complete the cure. At once the child was restored to full health and vigor. As to be expected, the report of those marvelous healings spread rapidly throughout the city and people came by the hundreds to visit the shrine. Soon the whole area around the altar was filled with abandoned crutches and canes and several whole glass-covered cabinets were filled with gold and silver thanksgiving offerings in the shapes of miniature hearts, arms, legs and other votive offerings. Scarcely two weeks after the solemn exposition of the picture, Pope Pius IX himself came to visit the shrine. He stood quietly before it for a long time and then exclaimed: “How beautiful she is!” He was given and had enshrined a copy of the original in his own private chapel and was often seen kneeling before it in fervent prayer. Later one, when the Archconfraternity of Our Lady of Perpetual Help was formed, he blessed the project and insisted that his name head the list of the worldwide membership. Pope Leo XIII, the next pontiff, had a copy of the picture on his desk so that he might see it constantly during his working day. St. Pius X sent a copy of the icon to the Empress of Ethiopia and granted an indulgence of 100 days to anyone who repeated the phrase: “Mother of Perpetual Help, pray for us.” Pope Benedict XV had the picture of Our Lady of Perpetual Help placed immediately over his chair of state in the throne room. Here it could be seen by all just over his head, as if to say: “Here is your true Queen!” Many famous cardinals (Like Mercier of Belgium) and bishops (like von Keppler of Germany) declared the Mother of Perpetual Help their own special patroness. Rapidly the Madonna became known outside of Rome. Pope Pius IX told the Redemptorists, in speaking to them of the treasure he had committed to their care: “Make her known!” It seems as though they hardly needed the exhortation. In the United States, they built the first Our Lady of Perpetual Help church in the Roxbury section of Boston, and it was eventually raised to the honor of a “Papal Basilica” by Pope Pius XII. Of all of the sacred images and shrines of Our Lady related to this book, one can say without exaggeration that through the icon of Our Mother of Perpetual Help she was indeed established her domain throughout the whole world.